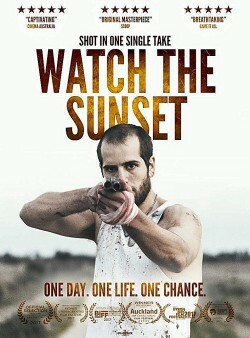 Your new movie Watch the Sunset - in a few words, what is it about? TB: In a single afternoon, a man comes to grips with the power of his past when his estranged family becomes entangled in its web. 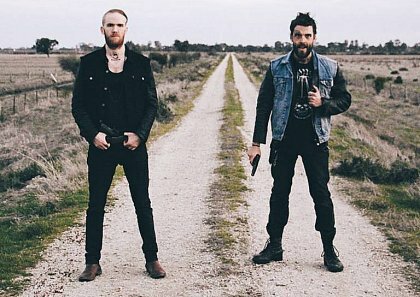 Basically an ex-bikie member is on the run from his gang and a past he can�t escape. First things first of course, why a one-take movie? MG: The nature of the content of Watch the Sunset pushed us in that direction early on. The fly-on-the-wall approach that we employed of the one-shot makes it so the audience is with the character/s in every single moment of this horrific part of their lives. That raw, gritty nature you feel when watching was essential for the film to work. What were your inspirations when writing Watch the Sunset - and did you plan this as a one-take movie from the get-go, and in what way did that impact your writing? TB: The story was based on true events and the characters on real people whom I have personal experience with which stirred me to write the concept. So the biggest appeal or motivation for me was bringing light to their story and this raw reality in regional Australia. The theme of an underdog seeking redemption along with the technical challenges of shooting the film in a single take was thrilling to me. MG: I think they all came hand in hand. One inspiration led onto another inspiration and it snow-balled from there. Our film-based genre inspirations were Animal Kingdom and Snow Town. Their raw, gritty and uncompromising approach to film making had opened up a big world for us to draw from while writing. What was being said while no one was talking, how to fill the gaps between those pieces of dialogue. We knew that the one-shot was something we were always curious about but knew it wouldn�t work without the story to carry it. We had to have the right story before committing to the one-shot feature entirely. Boxing Day, Russian Ark and Birdman were huge inspirations in the development of the overall arc as well. How do you keep a film moving forward, while not over/under-feeding the audience, while keeping the shot interesting and dynamic? It was a constant battle we had with the writing and development that we continued all the way up to the shooting dates. Now how do you even plan a one-set movie like Watch the Sunset, and how do you find the right locations to handle such an enterprise ... and did you sometimes curse yourselves for the approach you had chosen? TB: I actually have grown accustomed to working with extended takes. It is a lot more enjoyable for the cast as they have more of an opportunity to really get into the characters without stopping and starting, which happens a lot on normal shoots. But it does put an extreme amount of pressure on everyone, particularly the crew. The only thing I curse about is the compromise you have to make, sometimes elements suffer in order for others to be fulfilled. This made the end choice of take difficult, some days the cinematography was incredible but the actors performances were a little low and vice versa. But everything on the fourth day came together so that was a nice feeling. MG: Curses were had aplenty! But never because we regretted it, collectively everyone in the cast and crew (upon reflection most of the time) was hooked by what we were attempting, because it had never been done before like this. The budget caused a whole list of problems that needed creative solutions, and generally they were needed very quickly. The approach we chose has matured, moulded and solidified everyone as a filmmaker, so I guess you could never regret that. The location itself happened quite quickly and we were truly fortunate in being gifted with Kerang as our location. Kerang, our D.O.P./producer�s hometown, and the story seemed to fit perfectly from the start, that we actually started writing according to the layout of the town itself. The entire town pitched in to help as well and if we didn�t have their generosity, we wouldn�t have had a film. Watch the Sunset doesn't exactly hold back when it comes to violence - so what can you tell us about those scenes, how did you go about them, and was there ever a line you refused to cross? MG: All the actors in our film, except the amazing Annabelle Williamson, were trained at the Victorian College of the Arts. There, we were taught a lot about stage combat and how to safely, but effectively, create fight choreography while still being aware of who�s in control of those scenes so no-one gets hurt. We rehearsed extensively on those moments as well and that allowed us all to dive deep into the scenes, without losing that control. We knew that the world we were creating was far more unforgiving and terrifying than we could�ve imagined, all the scenarios in the film were actually inspired by true events. So when it came to what was possibly too far, it always came back to the story and what was needed to be said. TB: Yeah these events have actually happened, so we didn�t want to shy away from them. You also both appear in front of the camera in Watch the Sunset - so what can you tell us about your characters, and how much of a strain was it to act and try to keep things moving to get through your one take pretty much at the same time? TB: So I played Danny Biaro who the story follows and I based the character on a person I know very well. So I just had to feel as though I was doing the actual person justice when acting, which is a very strong motivator. In terms of directing while we were shooting, we really were just acting. We had passed all of the responsibility onto the crew: Damien Lipp & Jesse Goheir-Fleet behind the camera, Ally Bj�rnstad organizing the locations and the timings, and the rest of the creative team who were incredibly self-sufficient and brought precision to their work. The 5 weeks of rehearsals was imperative to this success. MG: I think that was one of the biggest wins in having two directors. In rehearsals, when one was in the scene the other could step out to watch and vice versa. So when it came to being in the character on the day and relenting the power over the film, we were confident everything was already in place. We also gave a lot of artistic license to our actors. We had cast them all very early on knowing they would have visions of their own that only complimented the story. Aaron Walton and Chelsea Zeller had a lot of input in the writing of their scenes as well. My character Russell is definitely the most unpredictable person in the film. Like Zia Zantis-Vinycomb�s character Charis, Russell doesn�t have a lot of screentime in the overall film, but when he�s on the screen you�re on edge. I knew that Russell was someone that I could have a lot of fun with and that that would test the actors around me. MG: We were gifted to have spent 3 years of training with most of the cast at VCA and when it came time to writing the film, their names were instantly in the mix. We knew we needed a rare intelligence that would give Sally the depth, authenticity and vulnerability required, and Chelsea Zeller had all that and more in spades. She brought a deep strength to Sally and her ability to show a million things at once and have each and every single moment be drenched in the reality of the situation was incomparable, as you can tell it was an easy choice. I think one of the most modest but essential roles in the film was Charis, played by Zia Zantis-Vinycomb. I can�t imagine anyone giving Charis such an incredible performance that lasts with you long after she�s left the screen. Zia managed to give a performance of innocence and fragility, with next to no words. Pretty awe-inspiring. TB: Also Chelsea actually came on board to write the film when I pitched the idea, so we scripted a lot together and she knew where the character had to go. I�ve acted alongside Chelsea since we were teenagers, so in a way that really worked for the characters. I had always wanted to work with Aaron Walton because he is a very bold actor and doesn�t shy away from making big choices which I love watching. There is also nothing better than working with an actor who will bring something fresh every new take. And Annabelle Williamson who played Joey we came to through an audition process of all the kids in the area where the film was shot. She is such an incredible kid, so smart and clued on for her age but maintains her childlike innocence. I still can�t believe we came across Annabelle, and her supportive parents were instrumental in her performance. MG: We worked towards the shoot extensively, with all the crew and cast, for about 4-5 weeks in the lead up to the shoot dates. We�d given ourselves 7 days to actually capture the film, starting around the exact same time every afternoon. We all had multiple jobs that were required of us and each and every single person stepped up to the mark more than we could�ve hoped! I think the closeness of our shoot combined with everyone�s desire to help out in anyway, made for a unique filming experience that I know will be hard to ever find again! The atmosphere was exciting and inspiring and I�m so grateful that everyone who did help out was able to. MG: Well, we�re currently in the process of embarking on our submission path for local and international film festivals. It�s an incredibly exciting time for Watch the Sunset as we are able to spread the film to a wider audience and through that process, we�re hoping to secure a distribution sale that will get the film out into cinemas. So, hopefully, next we will show the film to the public. Anything you can tell us about critical and audience reception of your movie yet? MG: We�ve been incredibly humbled by the attention the film has received so far from so many different walks of life. So far, the film has been able to show us that it has the ability to connect no matter where you grew up or what circles you currently exist in. Watch the Sunset focuses on people�s capacity to change and to let that be fuelled by the love of others. It�s something we always spoke intensively about while creating the film, but we have been genuinely surprised by how great the impact has been on such a diverse range of people. MG: I�ve written a TV show that�s based on my days in the removalist business, set up in the same style as The Office. I�m also currently writing a script with a friend for a feature film that follows a few kids in their final year at high school and the expectations that are thrown onto them from the �grown ups� around them. Think Whiplash meets The Perks of Being a Wallflower. TB: I�m in preproduction for another feature that deals with long extended takes, it�s a post apocalyptic thriller set in the Australian desert. Also scripting another film, which is a survivalist horror, set in the Norwegian mountains. Another project to keep an eye out for is a quirky short film I directed called Gabby�s First Time that should be hitting screens in the very near future. Every donation over $2 is completely tax deductible also, so that�s a win!